It'd been a while since my last visit to Las Vegas, so a return trip was appropriate, especially considering that it was my birthday weekend. I had a Cirque du Soleil show to catch later that night at the Bellagio, so a light dinner at Guy Savoy (pronounced ghee sah-vuah) at Caesars Palace was in order for meal #1 in Vegas. But first, a bit of history: Monsieur Savoy was born in 1953 in Nevers, a commune in central France in the Bourgogne region. A couple years later, his family moved to Bourgoin-Jallieu, a commune in the Isère department of southeastern France. His mother ran a small restaurant, and living near Lyon, the so-called culinary epicenter of France, Savoy was exposed to an environment that imbued within him a love for great, seasonal food. As a result, at age 15, a young Guy Savoy already knew that he was destined to become a chef. Shortly thereafter, Savoy began apprenticing at various establishments in the country, beginning with chocolatier Louis Marchand. In 1970, he moved to the famed restaurant Les Frères Troisgros in Roanne, then to Chez Lasserre in Paris, to Lion d'or in Geneva, and to L'Oasis in La Napoule. In 1977, Savoy was recruited by Claude Verger to run the kitchen at La Barriere de Clichy in Paris. Then, in 1980, Savoy opened his eponymous restaurant on Rue Duret in Paris, which proved quite successful, garnering its first étoile Michelin after only a year, and its second in 1985. In 1987, Restaurant Guy Savoy moved to the nearby Rue Troyon, where it sits today; the restaurant achieved 3-star status in 2002, and it was also in this year that Savoy was voted "Chef of the Year" (Chef de l'Année) by his peers. Savoy also owns four other eateries in addition to his namesake: Atelier Maitre Albert (a rôtisserie), Les Bouquinistes, and Le Chiberta, all in Paris, and, of course, the subject of this post, Restaurant Guy Savoy in Las Vegas. The restaurant opened in May 2006, and is a close counterpart to its Parisian brother, with a menu that is about 90% identical. Savoy's son Frank (formerly of the one-star Le Chiberta) runs the show in Vegas and oversees service that is formal, yet not overly stuffy, with a right amount of levity and warmth. In fact, the younger Savoy greeted me upon entering; his charisma was palpable, and he jokingly offered to dine with me upon hearing that my dining companion had cancelled on me (I then asked if he was going to pay!). Restaurant Guy Savoy is situated on the second floor of the Augustus Tower, across from the Qua Spa and the hotel's wedding chapels, and well away from the hustle and bustle of the casino floor. 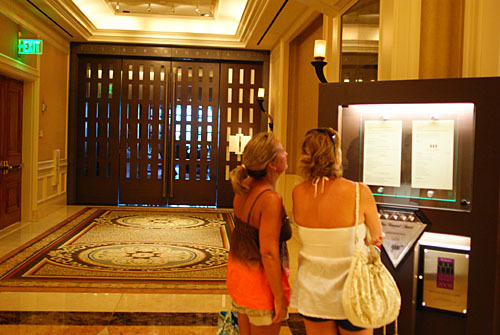 The entrance marked by large slatted double doors, set in dark wood--they recall the doors of the original Rue Troyon location (much in the same way French Laundry's signature blue doors are duplicated at Per Se). The dark wood motif continues in the Jean-Michel Wilmotte-penned interior, where it's nicely contrasted by the light beige walls adorned with contemporary art--the overall look is serious and sleek, modern and minimalist. Large windows drape the space in natural light, and also provide a view of the "Eiffel Tower" (the Paris restaurant has no such view!). The restaurant seats around 75 diners, in the main dining room pictured above, as well as in three private salons--Axelle, Eliott, Leah--named after some of Savoy's grandchildren. Finally, a chef's table in the kitchen seats six. A few dining options are available. There is a three-course $98 Pre-Theater Menu, a $190 TGV Menu ("a 90-minute experience"), and a $290 Menu Prestige (shown above, click for larger version), featuring an array of Savoy's best-known dishes, as executed by Executive Chef Eric Bost. You can also go à la carte, buy why? 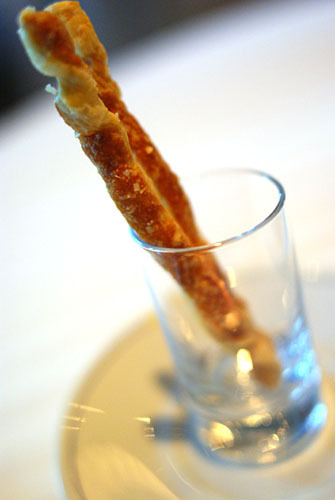 For smaller budgets, an appealing option is the "Bites and Bubbles" menu of small plates, available in the restaurant's "Bubble Bar." Or, on the opposite side of the spectrum, there is the newly-created Krug Menu, a $750 six-course menu paired with Krug Champagne, including vintages 1985, 1988, 1990, and 1995 (no Clos du Mesnil or Clos d'Ambonnay though unfortunately). 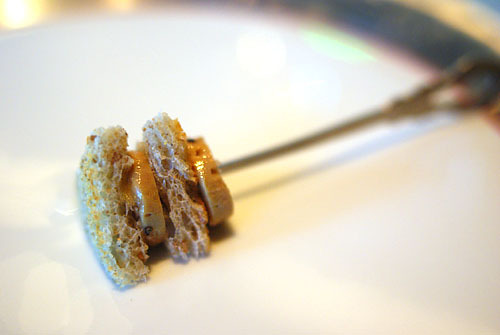 Upon being seated, I was brought this "French Club," consisting of alternating layers of duck foie gras and brioche. The initial flavor was quite mild, with the bread taking a more dominant role; however, as I chewed, the essence of foie gras became stronger and stronger, ending in a manner not unlike that of a foie gras terrine. Also notable was the textural contrast between the intentionally stale bread and the creamy foie. 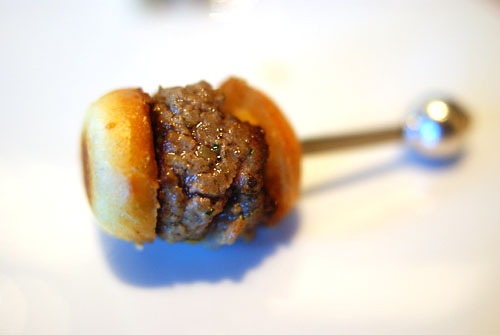 Next was another micro-sandwich, the "French Burger" of cooked beef tartar with Parmesan cheese. It was ridiculously tender and flavorful, with a bit of a tangy finish to boot. If only full-sized burgers could be this intense! At this point, some bread was brought out--first, a plate containing a large loaf of black pepper-rosemary country loaf, and then a shot glass holding a pair of bread sticks. The sticks were especially notable, as I was expecting something rather hard and brittle, but instead got bread that was flaky and cheesy. They were delicious, reminding me of the gruyere gougères at CUT. Bread was served with unsalted butter, pepper, salt, and salted butter. 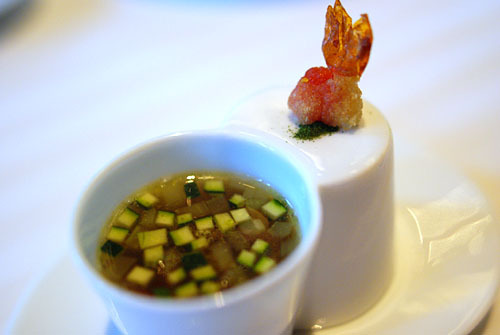 Next was the formal amuse bouche course. I first tasted the parsley-based minestrone soup with celery, tomato, and cucumber. It was a light but hearty potage, with a tangy, vegetal, even nostalgic taste that harked back to my childhood. I then had a tiny tomato tempura, a small bite with a lovely tart, creamy, cool center balanced by a savory, crunchy exterior. But wait, there's more! Lift the plate and you'll find a quenelle of warm beef salad with romaine and tomato. 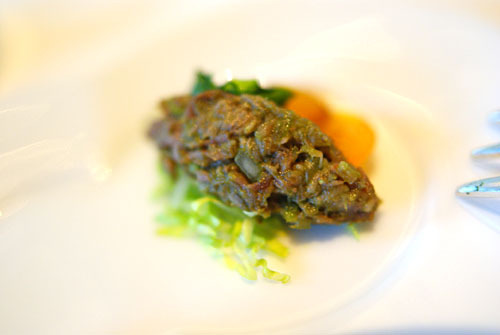 This was my favorite of the troika, and reminded me of a braised preparation of beef, but lighter. It had a profound depth of flavor and tender, yielding texture--excellent. I was then presented with the most impressive display of bread I'd ever witnessed (yes, even more impressive than at Robuchon!). There was no way I was going to remember all the varieties; I mentioned this to the bread server (pictured above), and he suggested a bread pairing. I'd never experienced such a thing before, so of course I responded affirmatively. Now, I don't if it was because I was taking photos of the food, or perhaps everybody gets this, but my meal proper started with a dish that wasn't listed on the menu (it was from the TGV, in fact). I'm not complaining, however, as it turned out to be one of my strongest courses of the night! 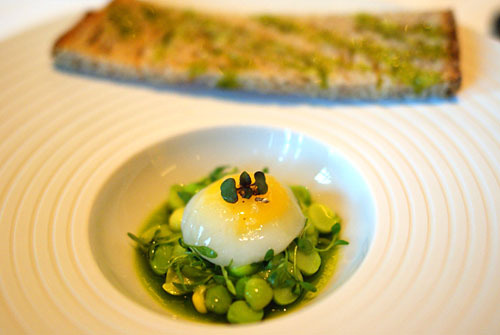 We have here twice peeled (to extract maximum pea flavor) English peas, over a pea gelée, in a pea purée, dressed in chive oil, mixed with what I believe were curly cress microgreens, topped with a quail egg (which my server proceeded to slice open), and served with a country loaf brushed with more chive oil. My server stated that the dish was meant to represent the transition of seasons from spring to summer, and indeed, it was a breath of fresh air, like eating freshly picked greens. The very quintessence of pea was captured so forcefully, so elegantly in this dish. The peas' flavor was so sharp, so shiny, while the microgreens provided a delightfully bitter, tangy, lingering finish that was deftly balanced by the rich, creamy, decadent egg--sort of the polar opposite of the veggies. A light, bright dish like this deserves a wine in the same vein, and the Vouvray from producer Marc Brédif fit the bill perfectly, showing sweet, fruity citrus and grass notes over a slightly effervescent body--a great start. Now we get to my "official" first course, which was only a little less wondrous than the Petits Pois. There's lobster, sure, over a chevril-tarragon gelée, topped with calamari and tapioca cooked in a lobster sauce, then flanked by an haricot vert-pea herb salad on either side. The lobster itself had a just about perfect, snappy texture, and was imbued with a great citrus tang--I would've been happy just eating it alone. But that would be missing the point. The calamari sauce added a superb savoriness and depth to the crustacean, while the use of tiny tapioca pearls provided a fantastic chewy textural element. And I still haven't gotten to the salad, which contributed yet another dimension to the course, with its great crunchiness from the peas and its crisp vegetal contrast, lightening the whole amalgam. Finally, we have the bread, a seaweed ciabatta. What was interesting about it was that initially, it tasted just like any other bread; it was only until further mastication that its seaweed flavors were revealed. 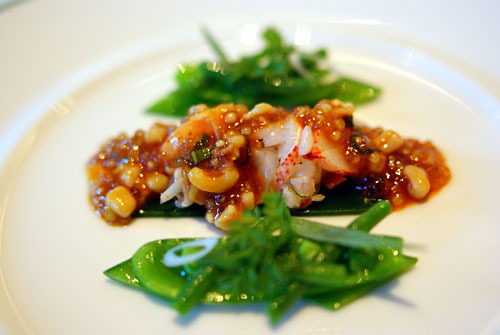 The pairing of the briny, ocean-y seaweed with the natural flavor of lobster: brilliant. Another excellent course. 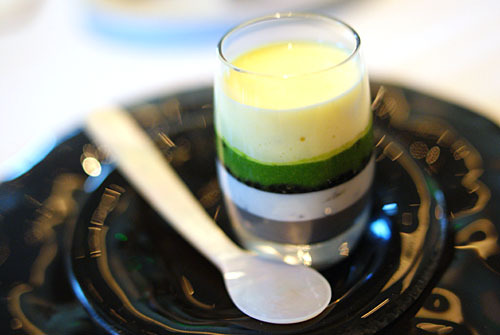 Next was one of Chef Savoy's most well-known creations, a multilayered affair of caviar vinaigrette, topped with caviar crème fraîche, topped with Ossetra caviar, topped with haricot vert purée, topped with hot egg sabayon, all eaten with a traditional mother of pearl spoon. Upon sniffing, I noted an eggy nose from the sabayon, while the first bite revealed a flavor progression of sabayon, haricot vert, caviar, and haricot vert again, in that order. Bite number two was sabayon-caviar-crème fraîche-caviar, and subsequent bites were subtly different, depending on how the various layers were intermixed. This was a fascinating study in different textures, tastes, and temperatures--I wanted a bigger glass! 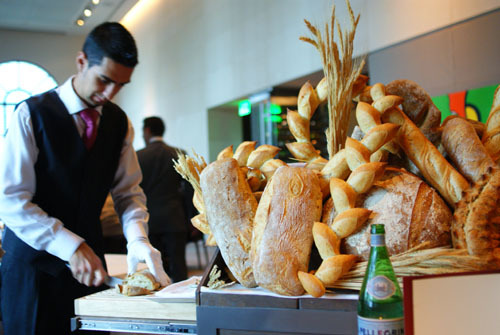 It was interesting to note that, in order to accentuate and not overwhelm the delicate flavor of the caviar dish, the bread server paired a simple, mild, plain ciabatta with the course. The wine too, needed to underscore the caviar without dominating it. I thought that the Schlumberger did a great job, with light floral and mineral flavors in a pleasingly dry Riesling. 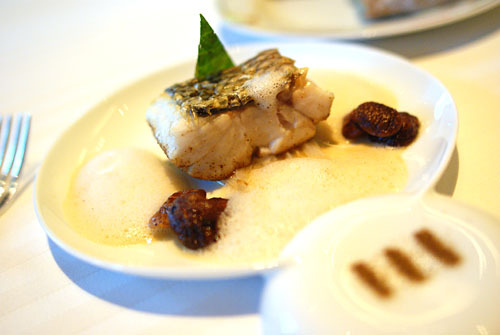 Another one of M. Savoy's signature dishes is this sea bass, cooked skin side down (to make it crispy), topped with a ginger-vanilla fish stock foam, served with white and green Swiss chard and baby shiitake mushroom, and garnished with a commixture of spices including black pepper, fennel, and Sichuan pepper. Smelling it, the dish gave out an intense vanilla nose due to the foam, and eating the fish alone, this vanilla essence proved too powerful for the sea bass, overpowering the fish's natural flavor. So what to do? The key was to pair the fish with the other items on the plate. 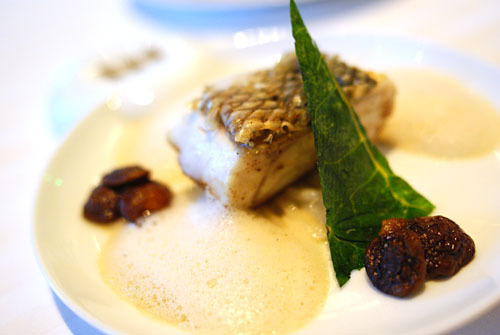 The chard, for example, tempered the vanilla's sweetness with a refreshing bitterness, while the shiitake added vegetal and earthy notes to balance out the bass, and the spices, naturally, provided a spicy finish to foil the fish. Even the bread played a role, with the bits of lemon zest and lemon confit contributing a sour tang, neutralizes the fish's sweetness. Texture-wise, I had no complaints, as the flesh was rare and tender, replete with a wonderfully crisp, savory skin. I'm generally not a huge fan of cooked foie gras, much preferring the liver in terrine or pâté form, so I wasn't expecting much from this course--big mistake. The kitchen starts with Hudson Valley Moulard duck foie gras, which is pan-seared, then cooked en papillote. This means that the foie is sealed in a plastic pouch and then cooked; the food thus steams in its own juices, along with cherry vinegar and pink radishes. 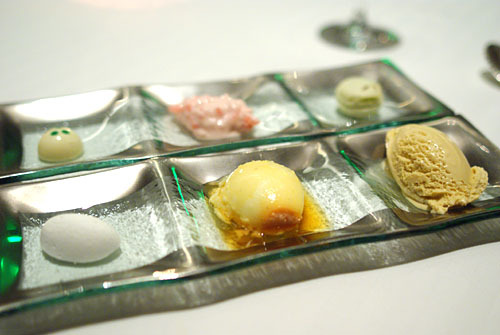 The transparent, bloated pouch is then brought to the table, where it's cut open, revealing the foie's intoxicating bouquet (a mix of unctuous and bitter aromas), before being brought back to the kitchen to be plated. 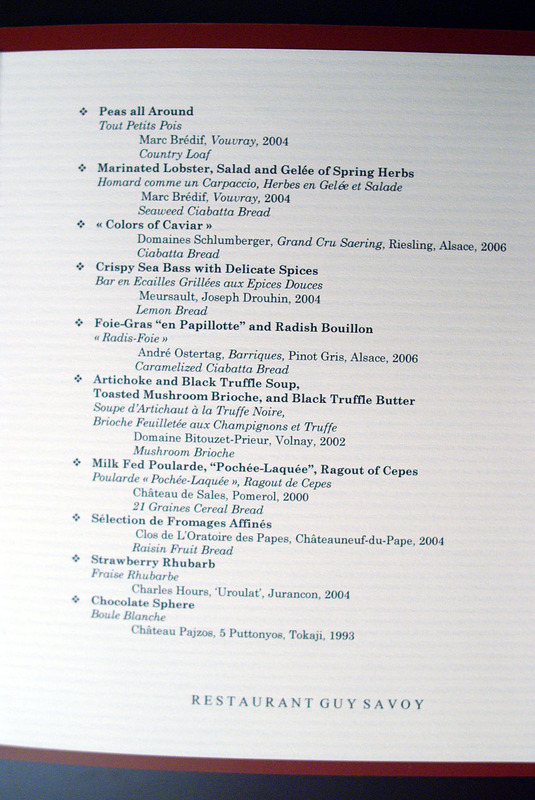 The result of all this hoopla was arguably the best cooked foie gras I've ever had. My problem with seared foie is usually that it's too sweet, due to accoutrements like pineapple compote or apricot marmalade. After eating this, I must ask, why suffer with overly saccharine foie gras when you could do it bitter? 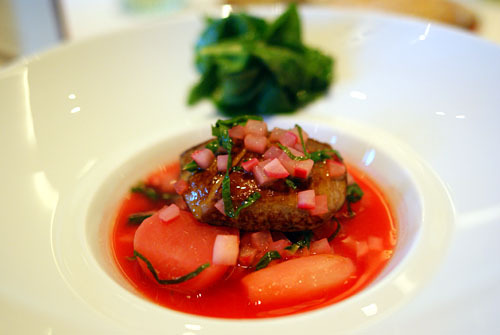 The radish really cut the weight of the foie gras, which would've been far too overwhelming and monolithic on its own. Using the radish leaves added a bitter, vegetal, spicy, pungent smack that took foie gras to new heights for me. Arguably Guy Savoy's most famous dish, we have here a soup of artichoke, topped with shaved Parmesan and sliced black truffle. The resultant aromas of this soup was about as heady as you could imagine, abound in the smells of truffle and cheese, two elements which continued onto the soup, which was absolutely saturated with flavor, held back tenuously by the relative levity of artichoke. 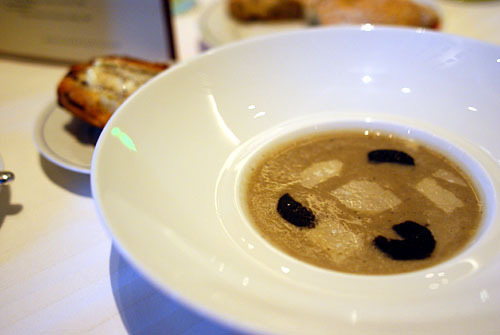 Really, it was the soup that was the star, not the sliced truffle itself per se. 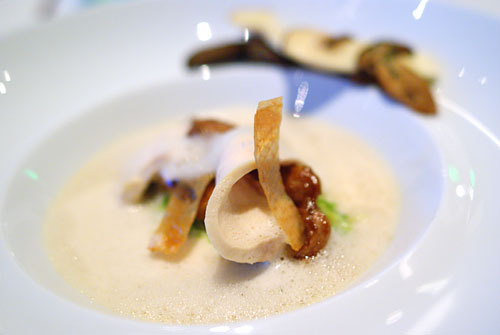 The potage's counterpart was the brioche, which was stuffed with mushrooms and spread with truffle butter. 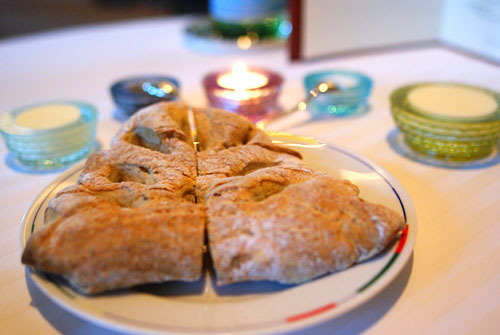 It was a rich, flaky, soft bread that my server encouraged me to dip in the liquid. This was a simple, yet prodigious, duet of flavors that stood up nicely to the wine, a Volnay from Bitouzet-Prieur that was simultaneously light, juicy, tight, and fruity. Though this was a chicken dish, it was quite unlike any other chicken I've had before--it was milk-fed, fattened young neutered hen, "poached-lacquered," with a chiffonade of cabbage, garnished with a duo of raw and cooked porcini (a.k.a. cepes). The chicken itself was quite firm, dense, heavy, with a creamy, mild flavor that was somewhat nondescript on its own. What made this dish was were the vegetables, with the cabbage providing a light, crunchy complement and the raw mushrooms--the best part of the dish--expertly balancing the weight of the chicken. What was interesting was that the bird stood up admirably to the red wine pairing, and not just any red wine, but Bordeaux, a Pomerol no less. The Château de Sales was a smooth, mature-tasting wine, with plenty of smoke, leather, and meat. Cabécou Feuille - My first selection was a soft goat cheese from southern France, one that's dipped in plum brandy and sprinkled with peppercorns before being wrapped in chestnut leaves. The result was a mild, slightly tangy, very peppery cheese that was quite unlike any I'd had before. Crottin de Chavignol - Arguably the most famous of Loire Valley cheese. A goat's milk cheese, the Crottin was slightly tangy and a bit nutty, with a medium body--I quite liked it. Don't eat the rinds on this one. Mimolette - A hard cows milk cheese with a cheese mite-infested crust, this is one I had at Michael Mina's XIV on opening night. 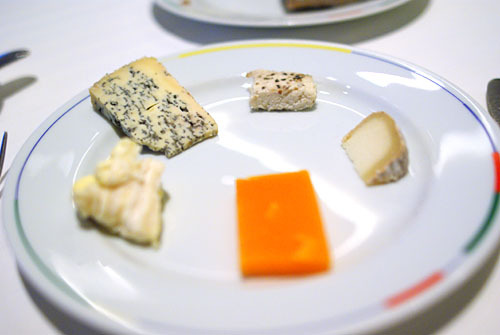 Originally created to resemble Edam, the cheese had a dry, savory, nutty flavor that went very well with the wine. Saint-Marcellin - Next was this soft cow's milk cheese from the Isère region of France. A rich, creamy cheese, it was my favorite of the bunch, showing lovely nutty and earthy flavors--very nice. Fourme d'Ambert - A fairly prototypical bleu, this was a semi-hard pasteurized cow's milk cheese from Auvergne, injected with Vouvray moelleux. This is another one that I had at XIV. 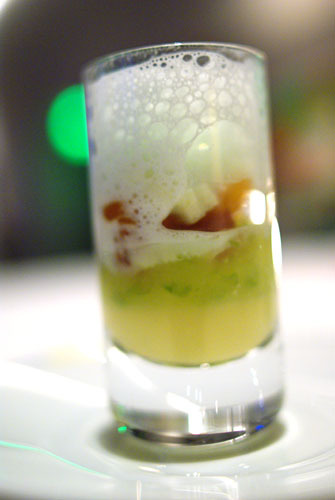 Intermezzo: "All About Green Apple"
Time for a little palate cleanser before the desserts: a green apple gelée, topped with green apple sorbet, green apple foam, and mixed with brioche. The cool, crisp, sharp, tart essence of green apple was superbly captured here, making for a rather bracing experience. The addition of brioche added a crisp texture contrast, and contributed a marked bready flavor, making the whole amalgamation somewhat reminiscent of apple pie. The first proper dessert was a study in different textures based on strawberries: strawberry gelée, chopped strawberries, strawberry crunch, all topped with strawberry juice. The sweet berry flavor was moderated somewhat by the slight sourness of the rhubarb sorbet, while the gelée provided a great textural counterpoint, and the sorbet a nice temperature contrast. This was a light dessert, so I was pleased with the pairing of the Uroulat, which was off-dry rather than sickly sweet, crisp not heavy, with plenty of apple and stone fruit flavors. 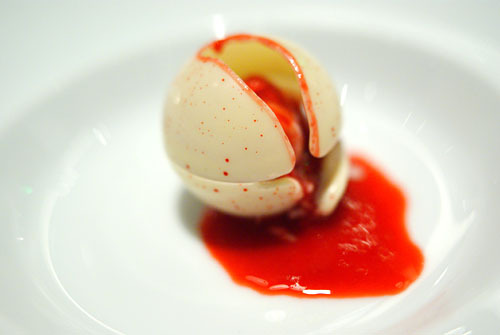 The dessert came presented initially as a red-speckled white sphere. 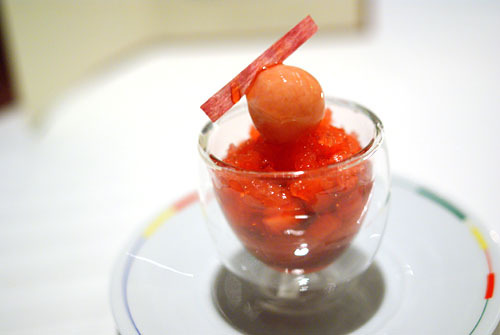 My server subsequently proceeded to pour on a raspberry consommé, which effectively broke through the outer shell, revealing a filling of raspberry sorbet and tuile. Though the chocolate shell was quite thin, it was surprisingly heavy, so the tart raspberry was effective in balancing it out. A heavier wine pairing was in order here, and the Tokaji worked nicely. Being a 1993, the wine was a bit older than I'm accustomed to having, with a taste that was more complex, more oxidized than normal. 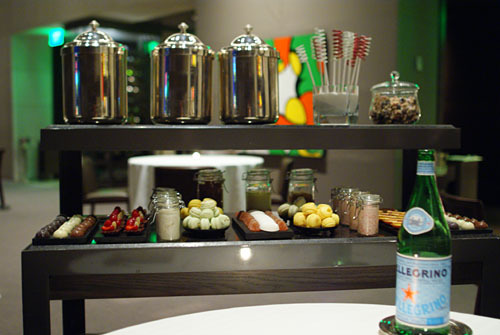 Now it was time for the funnest part of the meal: the mignardise cart! I was quite full by this point, so I tempered myself, limiting my selection to only six items. They were: (1) white chocolate with basil, with the strong basil mellowing the chocolate; (2) a surprisingly restrained praline rice pudding; (3) an herbal, then sweet fennel macaron; (4) crème caramel, basically a crème brûlée without its caramelized top; (5) a subtle lychee marshmallow; and (6) brown butter ice cream, with a rich, heavy caramel flavor. 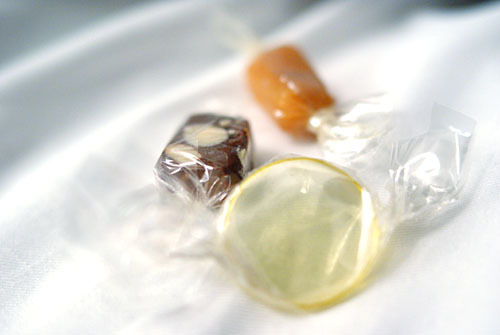 Grab a few chartreuse and caramel candies on the way out. During this meal, I kept thinking to myself that Guy Savoy may be deserving of a three-star Michelin rating. Given my last meal at Picasso, a fellow Vegas two-star, it seemed to me that Savoy and company were clearly in another league culinarily. And even looking back at the New York three-stars I visited over the holidays, the food at Savoy excited me more than that at Jean Georges or Le Bernardin, and perhaps even at Per Se. Overall, I came out quite impressed--the place exceeded my expectations, showcasing the kitchen's dedication to quality produce, precise technique, and culinary creativity. The food is unabashedly French, yet seems to be so much more, demonstrating some of the boldest, brashest tastes I've encountered in a while, with focused, lively flavors that seem to jump off the plate. Prediction: it took the original Guy Savoy 22 years to gain that third étoile, Vegas won't take nearly as long. So I missed this AND gave up my salary for the "privilege" of working 13 hours a day. I must be wrong in the head. After seeing this (better than Bernardin and JG) how can you blame me for making Las Vegas my next food destination? The Saint-Marcellin cheese that was your favorite was also the favorite of a past legendary french chef named Fernand Point, whose book Ma Gastronomie had a stark influence on Thomas Keller! that burger looks like a meat maracron! what a cool idea - burger shots! Looks like a fantastic birthday dinner! Hi Kevin: So worth the wait. Wow, Guy Savoy looked amazing. I wonder if it was better without a dining companion. I may have to try it solo next time. Do you make notes when you are eating or dictate it into your phone? I am always impressed with the detail. One more thing. With the Sea Bass, do you eat the skin, take a few bites of skin or leave it on the plate? I think I would have passed on teh cooked foie gras, but everything else was innovative. Were you there super early, and were you able to make the show in time? Cant wait for the rest of the reviews from your Vegas trip. Ahh! We were in Vegas at the same time! While you were at Guy Savoy, we were having a great time at L'Atelier de Joel Robuchon! But we're going to Le Bernardin and Jean-George next week (for lunch) and wd-50 for dinner. 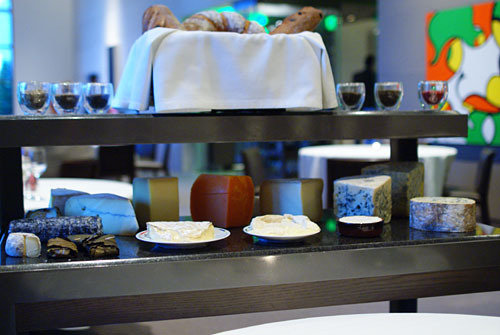 When I last went to Vegas, Guy Savoy was closed for a two week preparation for the new year. Bleh. Are you gonna hit up Lotus of Siam? To Jack: Alex is pretty damn good. 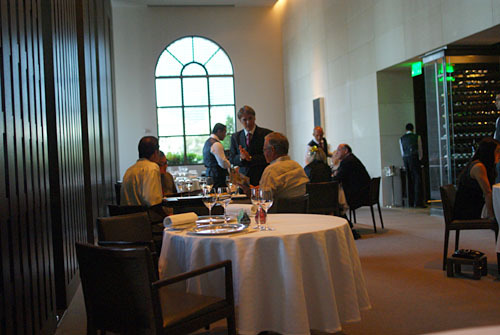 With Michelin nixing the 2010 LA/LV guides it might be a while before Savoy gets that next star. Yeah that next etoile might not be coming soon after all now that Michelin is abandoning LA and Vegas. That said, who cares, this looks really good and I need to go. I have to say, I REALLY want to try the Colors of Caviar the most. The menu and the meal looked fantastic and I want to try this on my next Vegas trip. kevin..you are going to busy this weekend answering all these comments! great looking spread. good question asked earlier...i assume the bread is the same bread all night or do they constantly replace it with freshly cooked ones? all those "carts" looked great. a bread pairing was new to me. and i got money on it like the previous comment..that if you had time before the cirque show that you went to in n out! Ryan: Ah touché. All that I ask is that Alex be on the agenda next time. Jack: Unfortunately scheduling would not allow me to try both places, and I ultimately decided on Savoy since the menu seemed more exciting. Believe me though, I really wanted to do a head-to-head comparison of the two. Rich: Burger King already came out with "Burger Shots." I tried them once and they were godawful. ;) As for the bread, all the bread on top of the cart is largely for show. The bread actually served is taken from elsewhere; I don't recall having any issues with temperature. Jo: I'm not sure what "Barbie" issues are, but I'm a fan of mini-food as well--means I can eat more! Evan: For me, dining solo generally means that I'm more focused on the food, but I find that the dining experience overall is better with (the right) company. As for notes, I pretty much always bring a notebook with me to any multi-course meal; here, I think I filled up six pages or so. For the skin, I definitely ate all of it--so flavorful, so crispy. Why pass on the foie gras, when it was arguably the star of the meal? I arrived at 6:00 (they open at 5:30), and had no problem making the show. Sharon: Ah, I was at L'Atelier the following night. ;) For a more casual experience at Guy Savoy, try out the Bubble Bar--no reservations required and you can get many of the dishes on the main menu; you can even move to the main dining room if you choose. Have fun in NY; I'll look forward to your posts! Charlie: I'm considering Lotus of Siam as well as Raku for next time (Alex too, naturally). The problem is that they're off-strip so I'm a bit concerned about transportation (I'll be flying so I won't have a car). Ryan: Just saw that on Eater LA today. Perfect timing on my part really. I suppose this dashes my hope of Michelin coming to Chicago? Fiona: Well, I just hope that the rating is reinstated within a few years. But like you said, it's worth a trip, étoile or not. Great review as always. Great photos too! Great review. I'm glad you enjoyed Guy Savoy --it was one of my favorite meals on a recent trip to Vegas and I only had time to try the Bubble Bar. I agree with you about the artichoke soup... the truffles are a nice touch but the broth itself is amazing. Was the restaurant crowded? During my visit the place was dead--I was the only one there for a good while. I hope Savoy stays busy and keeps turning out incredible food. 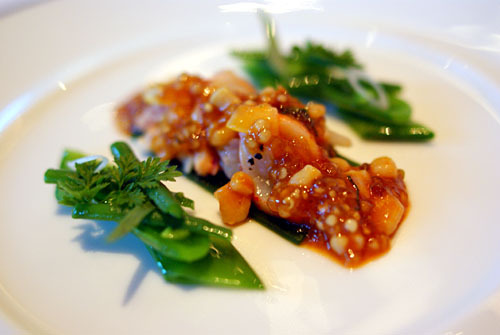 Hi Kevin, referred from Kung Food Panda and you happen to review Guy Savoy a place I was deciding between Alex. Obviously you did not order the pre-theatre menu as I was intrigue to know how that is played out. The bread table is massive and I've heard so much good praise including yours. Good write up. Wesley: Thanks! The photos didn't quite turn out as well as I'd hoped for though. Having both strong sunlight and ambient light was messing me up, really throwing off the white balance. 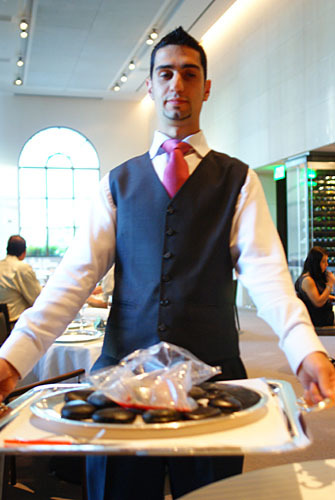 Michael: During my meal at Savoy, there were for other tables occupied, so about half the main dining room was full. Hopefully that's just a reflection of the curent economic state, and things will pick up in a bit. I'd hate to see Savoy shut down. Bonnie: I was deciding between Guy Savoy and Alex as well, and ultimately decided on Savoy, as its menu seemed more appealing to me. I was able to get out under 2.5 hours, even with the Menu Prestige; there's also the 1.5 hour TGV Menu. So if you have a show, you're not necessarily constrained to the pre-theatre menu. Was this for me? Hopefully! i dont blame you in regards to filling up at the bread bar. cant beleive you tried the BK burger shots. at least you are not a food elitist! i always thought this restaurant was called Guy Savory (as in tasty). guess my 3 years of french is tres mal! Paul: Prior to those Burger Shots, I'd never had a bad slider in my life. Even the White Castle ones were pretty tasty. Interestingly, my first White Castle experience was right after my first visit to Alinea. Not high, but probably fairly drunk. Supposedly your appetite is larger when high, but I'd imagine you'd have trouble concentrating on the food at hand. The receipt here was actually very straightforward. 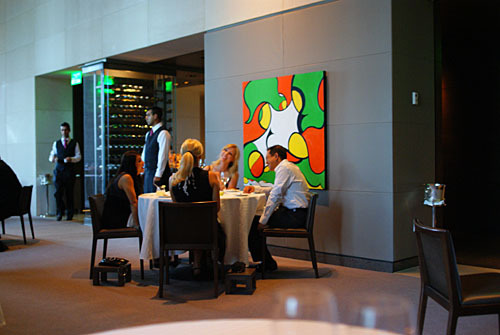 It was just the Menu Prestiage at $290, plus the wine pairings at $150. They didn't even charge for water! Thanks Andrés. Although I felt that, on this trip, Savoy was a bit stronger than Robuchon, I'd have to visit the two more to make a definitive judgment. Which do you think is better? Savoy really deserves Three Stars from the Michelin Guide for this restaurant. It is stellar! Perfect, if you will. Great post Kevin! Andrés: I definitely think that the two restaurants take different approaches to the overall experience. Unfortunately, I haven't been to both enough to make a definitive judgment. Cynthia: Sadly, due to Michelin leaving Las Vegas, we'll never know if Savoy's ever going to get that third star! fantastic recount of the meal. and am utterly grateful for reminding me of the name of the tokaji - we loved it! Glad I could be of service. This truly was a special meal.